You might remember that a fortnight ago I attended a conference hosted by the Brunswick-Coburg Anti Conscription Centenary people (among others). When I hear about a conference that I would have liked to have attended, I’m always delighted when the presentations are put online afterwards. That’s the case with this conference, so if you thought it sounded good, have a listen yourself! I attended a very enjoyable conference last Saturday at Brunswick, under the auspices of the Brunswick-Coburg Anti-Conscription Commemoration Committee, Melbourne Labor History Society and Victorian Trades Hall Council. Just look at the speakers: Barry Jones, Stuart Macintyre, Joy Damousi, Ross McMullin as the ‘big names’ but all of the speakers were excellent. The day started with a small group from Brunswick Secondary College (who featured in the play 1916 that we saw last year) who sang two songs from WWI. Barry Jones gave the keynote address where he outlined the political context for the conscription referendums of 1916 and 1917 (which someone noted was not ‘referenda’, as I always assumed). He pointed out that even before Federation, Australia had always been enthusiastic for war, with involvement in the Maori Wars, Crimea, US Civil War (on both sides), the Sudan, Boer War and the Boxer Rebellion. During WWI, Australia was impelled by a need to be seen, a sense of adventure and hope for reciprocal support. He described the political environment of the new Commonwealth, which before the war was relatively civilized, with no party system. Into this came Billy Hughes, a divisive figure, vicious campaigner and wrecker, who unleashed sectarianism and broke the ALP. He outlined why Hughes needed a referendum, and why he went for a second one in December 1917 after the first was defeated in 1916. He was followed by Murray Goot who analysed the returns of the two referendums, looking for patterns and anomalies. He challenged a number of the received explanations for the defeats, and explored a number of ‘what if’ scenarios, including a consideration of what might have happened if the second referendum had passed. Stuart Macintyre described the electoral context generally, then focused particularly on the Brunswick-Coburg area. Two local political identities were discussed in more detail. Peter Love spoke about the local Labor MP Frank Anstey- a man prone to hyperbole and opposed to conscription from the start. Caroline Rasmussen examined Maurice Blackburn (commemorated in the law firm of that name) who was M.P. for the adjoining seat of Essendon who also opposed conscription, but from a more dispassionate commitment to ‘liberty’, the right of conscience and the law. His wife Doris, was also an activist, although hampered by family commitments at the time. Kate Laing spoke about two women’s groups active at the start of the war that were both involved in international movements. The Sisterhood of International Peace, which emphasized ‘respectability’ was at first reluctant to take a position on the war, out of fear of the War Precautions Act. The Womens Peace Army grew out of the suffrage campaign, and was always the more activist organization. Joy Damousi expanded on the Womens Peace Army, led by Cecilia John. She emphasized how both sides of the conscription debate leveraged motherhood: what would a ‘responsible mother’ do? After lunch Ross McMullin emphasized the significance of the fact that while other Labor governments in the world only had to react from Opposition, the Australian Labor Party was in office, voted into power in 1914 largely on the strength of its Defence policy. He spelled out the options facing Hughes and traced the political maneuvering chronologically during the war. He then moved to the long term consequences, including the National Party’s portrayal of themselves as the party of the AIF Digger. From this point attention shifted to the Vietnam War and conscription. Ann-Mari Jorden examined the shift attitudes towards universal compulsory military training, from its introduction prior to WWI in 1911, the development of the Citizens Military Force between 1951 and its abolition in 1959, and the introduction of compulsory (although largely unenforceable) registration in 1964. She traced the treatment of religious conscientious objectors right from the Defence Act of 1903, and the gradual dropping of the ‘religious’ criteria of conscientious objection. The day finished with Paul Barratt, who is currently promoting the reform of the Australian Government’s war making powers, preferably so that a motion needs to be passed in both house of parliament, with a statement from the Solicitor General that it is legal, and passed by the Governor General. Jenny Grounds from the Medical Association for the Prevention of War canvassed an array of steps that the government could take to promote peace. So- what a treat! Excellent speakers, well-organized and lots to think about. Strictly speaking, a ‘festschrift‘ is a book of essays written by colleagues and students that is presented to an honorable person, generally an academic, during their lifetime. Well in this case, the collection of essays may come later in the form of a special edition of History Australia, because the main event here was a two-day celebration of Marilyn Lake’s career and writing at the beautiful 1888 building at the University of Melbourne. What a line-up! Even though I’ve only read a few of Lake’s works, and she wouldn’t recognize me at all, I couldn’t resist hearing such eminent historians responding to the wide range of issues upon which Marilyn Lake has written, held over two days in my own home town! Marilyn Lake is an Australian historian whose work has spanned the homefront response to WWI (both at the time and recently), feminism and gender, and the White Australia Policy. Her book Drawing the Global Colour Line, co-written with Henry Reynolds, is a major contribution to transnational history internationally and here in Australia. She is a fearless public intellectual, most notably after the Age published an abridged version of the public lecture ‘The Myth of ANZAC’ that she delivered in 2009. In the bitter and highly personalized response to her book, one angry male writer asked her “What have you ever done for Australia?” Well, this festschrift was a resounding answer – even if he wasn’t there to hear it. Last Monday 20 October I attended a panel forum presented by the ANZAC Peace Coalition Forum, the first of four that will be conducted over the next year. This first one dealt with the era from Invasion to Federation; the next one planned for March 2015 will look at Federation to 1920; another in August will cover 1920s-60 and in October from the 1960s into the future. Judging from the first session, the series has certainly got off to a good start. 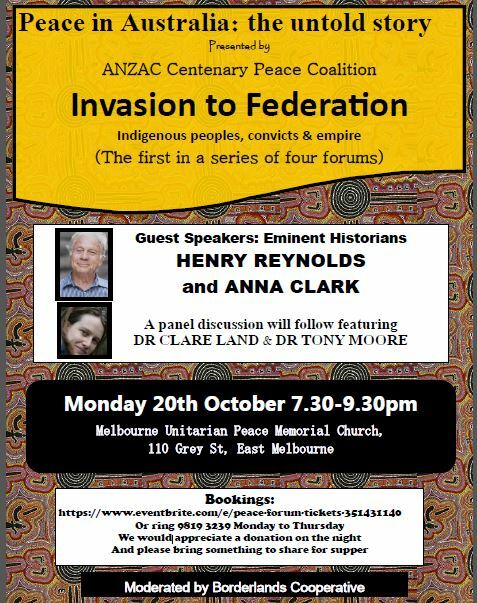 Given the time span delineated in this first forum, I expected Henry Reynolds to speak on the frontier wars between settlers and indigenous people, but he didn’t. Instead, he spoke on the work he is currently undertaking on the Boer War (1899-1902), which coincided with Federation. His presentation focussed on the Federation celebrations held in Sydney during the first weeks of January 1901. Australia had a great deal to celebrate. Along with New Zealand, it had the highest per capita income and better distributed housing and education than anywhere else in the world. It had strong institutions, a burgeoning labour movement that was represented at the political level, and a constitution adopted by referendum twice. It was one of the most advanced democracies in the world. And yet, it was as if they (we?) didn’t know how to celebrate political achievements. Instead, the celebration was trumped by the military. The Australian colonial troopers were engaged in the Boer War, the newspapers were full of military news, and when the returned soldiers marched in the Federation parades, it became a celebration of military might rather than political achievement. The mother country had sent out a large contingent of grandly decked-out imperial troops in what Reynolds suggests was a deliberate statement. There was an emphasis on the glamour of war, empire and aristocracy, and the largest cheers were for Lord Hopetoun, the Governor-General. Even then, there was the anxious pride that we be seen to be ‘punching above our weight’- an ongoing trope of insecurity that we’ve heard voiced again recently. The newly federated Australia gambled on the permanent continuation of the empire, but it was an empire in decline. We were a nation defined by race and culture rather than continent. The sad reality is that India was always more important than Australia. Reynolds was followed by Anna Clark from UTS who has been working for several years on the process of history-making, particularly in schools. Her interest is “historical inheritance”: not just what we produce, but what we consume. History is to the nation, she says, as memory is to the individual. The histories we create are inherently selective, speaking to the concerns of the current generation. She spoke of her own family history, which she had understood to be that of an honorable pioneering family. It was only when she realized that a massacre of an aboriginal woman and children on the O’Connell plains occured on her family’s property, that she came to question this family ‘truth’. Five men were charged for the massacre, and all were acquitted. This was her family. Forgetting and the deliberate withholding of history is never benign, even though it may driven by motives of ‘protecting’ the family. Especially in light of the recent recommendations about curriculum that call for “imparting historical knowledge and understanding central to the discipline instead of expecting children to be historiographers”, there is a danger that we will forget that histories are always constructed, subjective and incomplete. 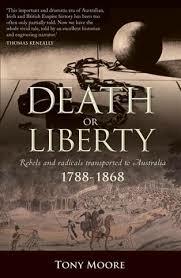 Then, Tony Moore from Monash spoke about his recent publication ‘Death or Liberty’ (review to follow when I finish reading it! ), which will form the basis of an ABC documentary next year. The European historian George Rude estimated that there were 3000 political prisoners sent out to the Australian colonies, and Moore’s work examines these discontents of Empire who are often revered in their source countries but largely unknown here in Australia. 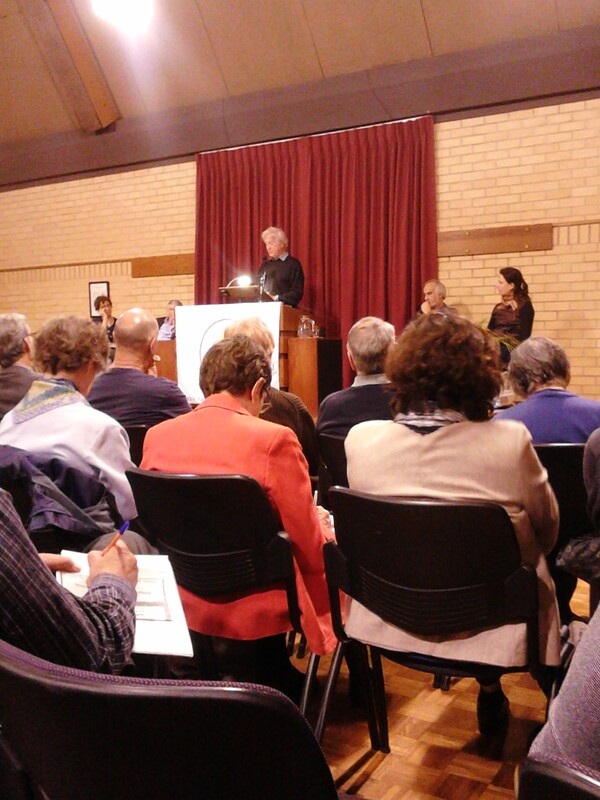 He emphasized the transnational radical scene of which they were a part, with an emphasis on the Scottish martyrs, which is appropriate given that the forum was being held in the Melbourne Unitarian Church (Thomas Fyshe Palmer, one of the martyrs, was a Unitarian minister). Some of these political prisoners returned home, published and even became public or political figures in their home countries which had earlier sent them to the 19 century equivalent of Guantanamo Bay. Some chose to stay in Australia. The post-federation national focus has blinded us to the internationalism of these political figures. Finally Clare Land spoke about solidarity between aboriginal and non-aboriginal people in the indigenous struggle in pre-Federation Victoria. She focussed on two people: Ann Bon, a critic and then member of the Board for the Protection of Aborigines, and John Green, the manager at Coranderrk mission at Healesville. She questioned what it meant (and means today) to be an ally of the Aboriginal people of south-eastern Australia. Always it is about land, but also constitutional reform (the referendum then, the Recognize campaign today). The question-and-answer session that closed the evening was interesting. It is a sobering thought that Australia will be spending $325 million on the commemoration of the centenary of Gallipoli. That’s two hundred times what the UK is spending and twenty times the expenditure of New Zealand on the same event. Henry Reynolds left us with the observation that perhaps the ease of returning Australian troops to Iraq today has been made easier by this well-funded, twenty-year campaign to glorify war. (Again, I urge you to read his recent article ‘Militarism Marches On’ available here). This ANZAC Peace Coalition Forum, and the ones to follow, is just one step in countering this expensive, swaggering campaign. A day to oneself in Hobart, before the Transnational Masterclass, so what to do? I know that I could do MONA, (the Museum of Old and New Art) but I decided to save that for our next trip to Tasmania, when Mr Resident Judge would be with me.